In today's issue of Science, a research team explains how wells that inject wastewater deep underground near Oklahoma City have caused earthquakes much farther away than we thought before -- up to 35 kilometers. Their model may make it feasible for regulators to try controlling these quakesif the industry provides them enough data. Oklahoma is not prone to earthquakes the way California is. It doesn't sit where tectonic plates are grinding against each other. But since 2008, Oklahoma has had a 40-fold rise in earthquakes large enough to feeland the state has become by far the largest seismicity source east of the Rockies. In fact, acre for acre, Oklahoma matches California these days in earthquakes larger than magnitude 3 (a size that people notice). The largest of these seismic events is a swarm of quakes near the town of Jones that has been going on for five years and counting. A number of especially large deep-injection wells began operating in Oklahoma around 2004. When the earthquakes began, suspicion was quick to focus on those wells. Could they be pushing the Earth's crust near Jones to the breaking point? Deep injection wells have a history going back to the 1930s, when Texas oil producers began using them to take the salty, toxic water pumped up along with the oil and put it back where it came from. Other producers of nasty stuff began using deep injection toochemical manufacturers and refiners, military suppliers, paper mills and so on. The Environmental Protection Agency has been regulating them, with a growing web of rules and oversight, since the 1970s, and today tens of thousands of deep injection wells, more than 9000 of them in Oklahoma alone, serve the nation without incident. Scientists have been arguing for a link between deep injection wells and Midwest earthquakes for several years, with growing confidence as the evidence improves. So far most of the studies have relied on statistical tests, but the new study makes a more direct case using the earthquakes of the Jones swarm and the injection records from the 89 nearest wells. The Science paper, by Cornell University researcher Katie Keranen and four colleagues, relies on computer modeling using well-known physics to predict how the rocks in north-central Oklahoma would react to being pumped full of wastewater at high pressure. The model shows that as the water is forced into the pores in the rocks, a wave of rising pore pressure moves outward from the wells at 100 to 150 meters per day. The resulting change in the state of stress is enough, as we know from elsewhere, to ease susceptible areas over the edge and trigger earthquakes. Not only does the pattern of the Jones swarm match the model, but also the model strongly suggests that injection wells can affect pore pressures much farther away than previously thought. 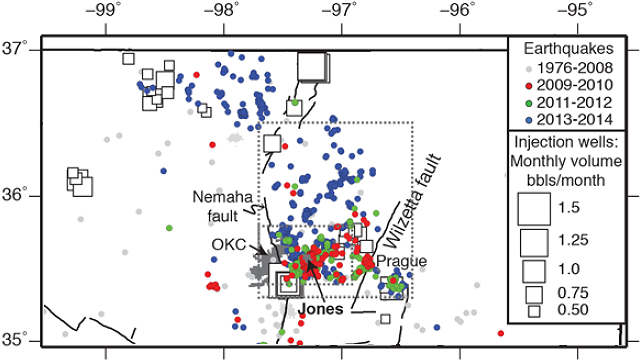 A study in the Journal of Geophysical Research published in April found that the Prague earthquake of 2011, at magnitude 5.7 the largest in recent years, was triggered by a foreshock that in turn was induced by deep injection wells. Keranen was part of that study, too. The state is responding to the wave of new scientific studies by installing more seismometers and requiring operators to keep records of their deep-injection volumes every day rather than monthly. The Oklahoma agency that governs well operations has begun ordering operators to cut back in specific cases. Oil and gas production was a huge industry in Oklahoma long before the widespread use of hydraulic fracturing (fracking) techniques. The practices that led to the Jones earthquake swarm are not connected to fracking. Instead, the wastewater comes from "dewatering plays," another unconventional oil production method that enables oil to be produced from deposits dominated by water. In this method, huge amounts of formation brine are pumped out before oil production begins to kick in. The wells in question are operated by the New Dominion company, which is reportedly in discussions with the state.